Posted on October 24, 2018 by Christopher A.F. Howey Ph.D. 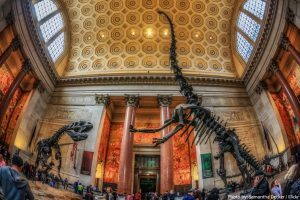 The Biology Department is sponsoring a trip to the American Museum of Natural History in New York City on November 10th. A bus will leave the Loyola Science Center at 8:30 am and will depart the Museum at 5:30 pm. Transportation and admission into the museum is covered! So this is an amazing trip that will cost you nothing. There are only a few seats left on the bus! So, if you are interested in joining us for an amazing trip, please contact Dr. Cara Krieg as soon as possible. You can reach her at cara.krieg@scranton.edu or just swing by her office (LSC374).